I would love to learn how that works. If there weren’t other people here, I’d be screaming right now. Caption/opis: A dragon skeleton a friend made for me. 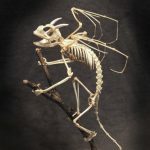 Components: Sugar glider body, bat wings and a chameleon skull with claws for horns. 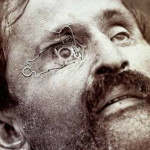 In 1870, a French ophthalmologist named Edouard Meyer included a series of photos in his textbook on surgery. The film of the era was too “slow” to take photos of actual operations, so he staged photos using cadavers. In this photo, a clamp holds the eye open to show where a scalpel should be positioned to remove a cataract. 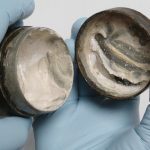 Preserved within a small tin canister, the cream was discovered during excavations by Pre-Construct Archaeology of a Roman temple precinct on Tabard Street, Southwark in 2003. 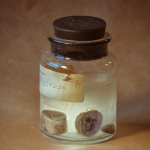 The main constituent of the cream was animal fat mixed with starch and tin oxide. 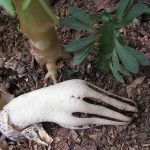 The picture above is of a mushroom thats thought to be a specimen of Clathrus archeri right before its fingers open up. It closely resembles a hand coming out of the ground. It even has the remnants of its tattered sleeves attached to the wrist. That is so freakin’ cool.